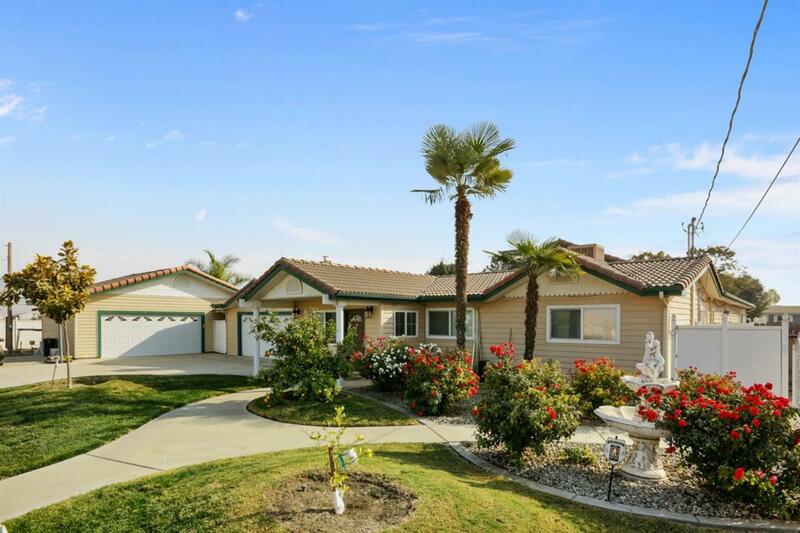 Country property on over an acre with separate guest home now available in Tulare! The main house offers over 3,300 square feet, a 4-car garage, vaulted ceilings with exposed beams, 4 bedrooms, 2.5 bathrooms, living and family rooms, a large bonus/game room, and a huge covered patio with a spa. The kitchen features granite counters, stainless appliances, a generous center island, a walk-in pantry, and ample cabinetry and storage options. The spacious backyard provides additional patios areas, a gated pool area, a large grass area with trees, a dog run, and a storage shed. There is also 14 owned solar panels, a newer A/C unit, and a water softener system. The guest house is approximately 1,000 square feet with 1 bedroom, 1 bathroom, laundry, living and dining areas, and a complete kitchen. The guest house has its own septic, propane, and electricity meter. The massive shop is 40' x 46' feet with a tall rollup door! This hard-to-find property won't last long! Call for your showing today!